Being a brunette, I always want beautiful, shiny caramel highlights to give my hair some depth and brightness. If you are a brunette, you are probably always on the lookout for the perfect highlights as well. Highlights are great for brunettes because they are subtle enough to blend well with your natural hair color, but light enough to brighten up tired looking hair color. 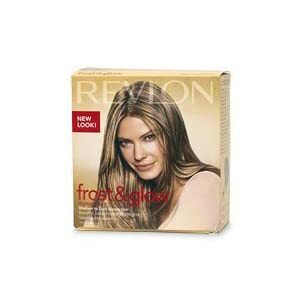 If you are a brunette looking to try something lighter and brighter as far as hair color goes, this may be just the right fix for you..
Revlon Frost & Glow High Lighting Kit for Medium to Dark Brown Hair, has gotten rave reviews from the do-it-your selfers out there. If you have virgin dark hair (meaning it has never been previously hair colored) and you want caramel highlights, this route may be a good one for you. The product promises ‘salon-quality’ results, just keep in mind the application is most important and directions should be followed to the tee! It contains powder bleach and a bleach cap for you to pull select strands through and high light. If you have previously colored hair, you may want to avoid this altogether as the product doesn’t come with a toner. Toners allow you to ‘tone down’ an unwanted hair color. A number of reviewers say they ended up with a lot of red tones on their previously colored hair. Of course, I am going to strongly suggest that you go to a professional hair colorist to get your highlights because I am a professional and I’ve seen many unhappy campers who have tried this at home. Dark hair is prone to pulling red tones when lightening. If you are looking for auburn highlights this may be ok, but otherwise brunettes are not big fans of red tones in their high lighted hair. A professional hair colorist knows the perfect product to use for your particular hair and has access to a wide variety of toners and hair colors, giving you choices when it comes to picking perfect color highlights. You can also protect your hair color by using hair care products formulated with sunscreen in them, which will help your highlights stay bright. As far as dark re-growth goes, that just isn’t a flattering look for anyone, so maintain your highlights by heading back to your hairdresser every six weeks or so for a touch up. Caramel highlights are beautiful and are a great way to brighten your current dark shade. What better time to get hair high lights than in the summer anyway? This may be another style I’ll steal this season! For more highlight ideas check out our Pinterest Hairstyles with Highlights Board. November 16, 2012 By: Paul Lynn Leave your comments (2), Your input matters.